When 96-year-old Connie Hickenbottom from Northwich passed away, the last thing her family and friends expected was to hear her voice at her funeral. 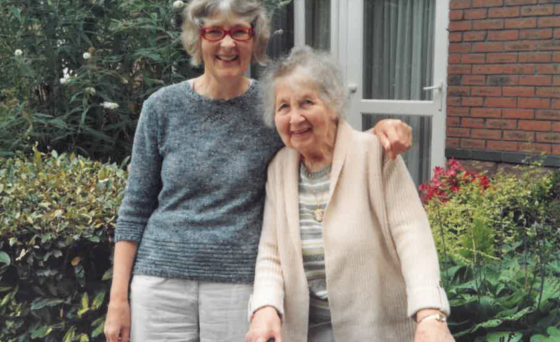 Connie, like dozens of other people, decided to record her life experiences, cherished moments and memories with the help of trained volunteers at St Luke’s. The service is free of charge. Sue Wynne, Connie’s daughter, said: “She was always talking about the old days and particularly about her earlier life before she moved to Northwich. The recording was done in her own home so it was very easy for her, and she felt comfortable. It was recorded in just one sitting. “She talked about her early life and her working life, some of which was new to me. She talked quite a lot about her experiences during the war, how happy she was in her flat in Northwich and she talked about her marriage. “The last question she was asked was what was her recipe for a long life. She said ‘a good laugh and a glass of sherry when you want one’ so I decided to play that comment at her funeral. Everybody was surprised to hear her voice but it made them laugh and was a lovely way to celebrate her life. The staff from the care home where she had spent her last two years went back and had a glass of sherry in her memory. Richard Cave co-ordinates the Recording Memories service for St Luke’s Hospice and has a team of volunteers who are trained to help and support people who want to record their memories onto a CD. He said: “When we look back at the old box of family photos, we can all reminisce about times past. However, one of the things that people really miss is the sound of a loved one’s voice.